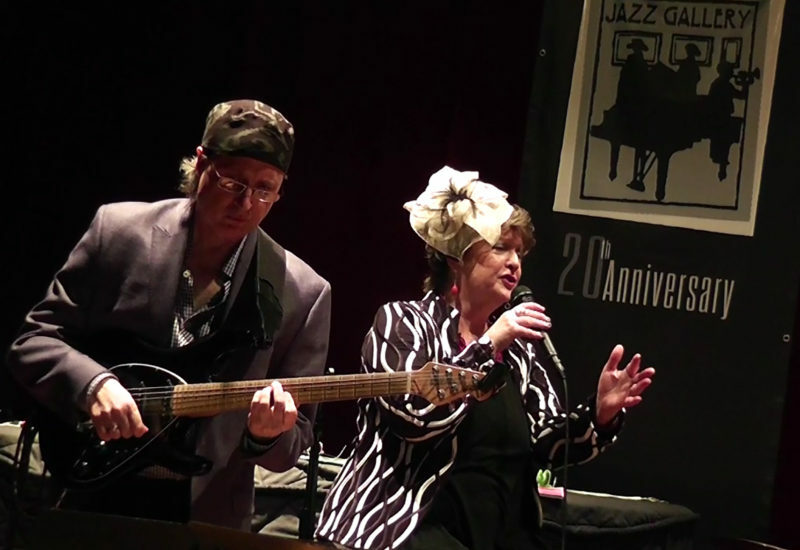 Featuring Judi Silvano on vocals & effects and Bruce Arnold on guitar & devices. There last time I reviewed a disc by Judi Silvano, was when she did a superb duo CD with the late Mal Waldron, somewhere around 2002, a long time ago. I’ve kept my eye and ear on guitarist Bruce Arnold since he collaborates with an odd selection of characters: Omar Tamez, Thomas Buckner, Roberta Piket and Ursel Schlict. So, I didn’t know what to expect when this disc appeared in our mail. It turns out this these two have created their own world, altered guitar and vocal/ sounds. I really like the opening song, a otherworldly blues with Judi’s hip-notic vocals harmonized with subtle alien effects. A sort of fairy-tale like vibe, rather like a distant relative to J.A.’s “White Rabbit’. Ms. Silvano sounds a bit like Iva Bittova on the aptly titled “Space Lullaby”, charming and child-like at times. Mr. Arnold seems to be using some spacey devices which sound more like electric bowed strings or even birdcalls. Ms. Silvano sounds like a sorceress on “My Neighborhood”, making quietly disturbing observations about her neighborhood. Silvano’s voice/singing are coming more from the Joan LaBarbara/Cathy Berberian school of experimental vocals. Effects and devices are used selectively here, never too weird or alien. Mr. Arnold does a great job of providing sumptuous sonic soundscapes without playing any predictable single note jazz solos. Mr. Arnold’s guitar sounds like an army of chanting monks as he plays those dark floating chords in the background. There definitely some strange moments where the odd alien vocals and spaced out guitar sounds seem to come from somewhere else far away. Whatever you do, you got to check out this one, “Great Plains”, there is something special going on here, completely enchanting with that great sly groove. This is followed by “Journey to Be Free”, another stunner, with a rocking’ groove but no rhythm team, just the guitar and voice. I certainly didn’t expect this disc to be the most surprising, odd gem of the month but that is what it is. Check out this duo at DMG next month. Featuring Judi Silvano on vocals & effects and Bruce Arnold on guitar & devices. 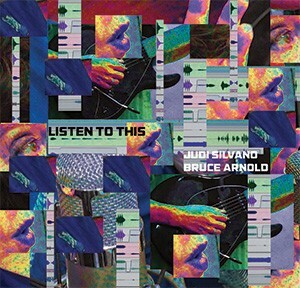 There last time I reviewed a disc by Judi Silvano, was when she did a superb duo CD with the late Mal Waldron, somewhere around 2002, a long time ago. I’ve kept my eye and ear on guitarist Bruce Arnold since he collaborates with an odd selection of characters: Omar Tamez, Thomas Buckner, Roberta Piket and Ursel Schlict. So, I didn’t know what to expect when this disc appeared in out mail. It turns out this these two have created their own weird world, altered guitar and vocal/ sounds. I really like the opening song, a otherworldly blues, spacy with Judi’s hip-notic vocals harmonized with subtle alien effects. A sort of fairy-tale like vibe, rather like a distant relative to J.A.’s “White Rabbit’. Ms. Silvano sounds a bit like Iva Bittova on the aptly titled “Space Lullaby”, charming and child-like at times. Mr. Arnold seems to be using some spacey devices which sound more like electric bowed strings or even birdcalls. Ms. Silvano sounds like a sorceress on “My Neighborhood”, making quietly disturbing observations about her neighborhood. Silvano’s voice/singing are coming more from the Joan LaBarbara/Cathy Berberian school of experimental vocals. Effects and devices are used selectively here, never too weird or alien. Mr. Arnold does a great job of providing sumptuous sonic soundscapes without playing any predictable single note jazz solos. Mr. Arnold’s guitar sounds like an army of chanting monks as he plays those dark floating chords in the background. There definitely some strange moments where the odd alien vocals and spaced out guitar sounds seem to come from somewhere else far away. Whatever you do, you got to check out this one, “Great Plains”, there is something special going on here, completely enchanting with that great sly groove. This is followed by “Journey to Be Free”, another stunner, with a rocking’ groove but no rhythm team, just the guitar and voice. I certainly didn’t expect this disc to be the most surprising, odd gem of the month but that is what it is. Check out this duo at DMG next month. While Judi Silvano may be best known for her extensive jazz catalogue, her passions extend well beyond, to embrace classical and free improv music. Her background in modern dance also adds an underlying spatial physicality. It is this spatial element that is particularly present on Listen To This, and a likely reason that working with Bruce Arnold proved to be so rewarding. Hailing from Sioux Falls South Dakota, Bruce Arnold has been exploring the potentials of his beloved electric guitar for years, using the program SuperCollider to summon up atmospheric soundscapes. His added fascination with 12 tone and pitch class theory as applied to improvisation lends his playing a distinctive harmonic and melodic voice. To find out more about what equipment was used on this recording please see bottom of page. Listen To This opens with “Remembrances” a bluesy rumination that is made sinister by the use of a half step combined with a major 3rd. A free improv that become a story of life’s complexity. Space Lullaby: The welcoming release of majestic arpeggiated guitar chords ring out like church bells to Judi’s soaring melodies. Cats Are Watching: This track provides some whimsy —ever wondered what the brain patterns of a cat might sound like? Complete Embrace: A hallucinatory art song incorporating poetic fragments into one of Judi’s compositions. There’s no vocal processing, allowing Judi’s rich voice to ring clear. Sioux Falls: Bruce’s ode to the running waters of the Sioux Falls. Travel Chant: Judi sings a brief melody as she walks through a crystalline landscape. In The Deep: an extremely ambient interlude with denizens of the watery abyss —complete with sonar. Listen To This: the most abstract of the composed tracks, with various repeating motifs. Great Plains: recalls the huge vistas of the west, and Judi waxes both lyrical and stratospheric. Journey to be Free: From obscurity to clarity, literally. Listen Again: A free improv interpretation of Judi’s composition “Listen To This” with an abundance of live sound processing. Status: In stock, physical CD ships in 24 hours. Digital downloaded MP3s are available for immediate access. Michal Shapiro created a video using one of the compositions on this CD entitled “My Neighborhood.” This video was honored by the Photoworks Organization Of Glen Echo Park, Maryland, USA and included in one of their video shows. If you order the CD download of “Listen To This” a copy of this video will be included. To find out more about Judi Silvano or Bruce Arnold please visit their websites. This entry was posted in Recordings and tagged bruce arnold, guitar, jazz, improvisation, pitch class set, supercollider, 12 tone, voice, vocal, listen to this, electronic, judi silvano, processing, Remembrances, In the Deep, My Neighborhood, Cats are watching, complete embrace, sioux falls, travel chant, space lullaby, great plains, journey to be free, listen again, soundscapes, sonic twist by Muse Eek. Bookmark the permalink.